Irish Ceramic Artist: Sculptor in Porcelain: Biography, Exhibitions. Every so often an artist comes along with an intensely visual ceramic art completely alter your perception of a particular medium or style. Ayelet Lalor is just such an artist. I think her sculpture of the female form is utterly captivating: not just for the intensely human attitudes they convey, but also the mood that seems to envelope them. Compare the almost oriental grace of Adriatic Bathe with the "bring-it-on" pose of Green Collared Diva, and the silent resilience of the bronze. See how she distinguishes and conveys each mood with the use of different lines, texture and colour. Her output includes bronze, porcelain and earthenware in a wide variety of forms - heads, busts, miniatures and full-length life-size figures. An innovative figure in contemporary Irish sculpture, Lalor has exhibited her work in several important group shows, at venues like: The National Museum of Ireland, The Limerick City Gallery of Art, The National Botanic Gardens, and The Hallward Gallery, Dublin. See: Crafts Council of Ireland. West Cork Craft & Design Guild. Born in Bantry, Co Cork, into an artistic family - her great grandfather was the head of sculpture at the Crawford, her father is a print-maker and writer, while her mother is involved in music and dance - Lalor began drawing figures at the age of four. She trained at the Grennan Mills Craft School and thereafter the National College of Art and Design (NCAD), Dublin, where she graduated with a BDes in Ceramics in 1996. Moving to London for two years to further her skills, she returned to Ireland and set up her own studio in Dublin. 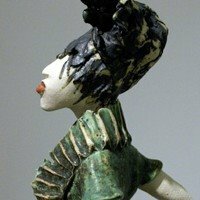 Now, after 10 years as a professional ceramicist, she is currently doing a Masters degree at NCAD, studying large scale multi -media figurative sculpture, including fibre-glass and cement. Lalor's overriding focus is to create "original art, not production line work" - a sentiment which underlines her drive to study and experiment, as well as her style of art. She works quite spontaneously, making instant sketches when she gets an idea, which she then translates into 3-D in her head. And of all the different stages in the ceramic process, it's the modelling stage which she enjoys the most. As she says, "I often feel something gets lost in the firing... before there is any colour, the work is sometimes more interesting." Over the past 10 years, her style has evolved from fashion-inspired ceramic furniture to flamboyant figures, to intensely textured heads and wall pieces, to retro bathing apparel, to flowers and other organic shapes - including pieces for site-specific and commercial locations - to finally her current focus on multi-media sculpture and bronzework. With all this under her belt at such a young age, one senses that Lalor's talent and drive could take her almost anywhere. Artists who have inspired her include: the French colourist Henri Matisse (1869-1954), the Viennese master Gustav Klimt (1862-1918), the Russian-born designer and sculptor Romain de Tirtoff Erté (1892-1990), but particularly the Spanish Art Nouveau architect Antoni Gaudi (1852-1926) and the Austrian painter and graphic artist Fritz Hundertwasser (1928-2000) - both for their mad colour and strange architectural sense - and the figurework of West Cork sculptor Pat Connor. Lalor undertakes a wide variety of commissions. For more details, see her website.  Keane on Ceramics, Pier Road, Kinsale, Co Cork.  O Reilly Turpin, Bridge St, Westport, Co Sligo.  Davern and Bell, 22 Thomas Street, Limerick City Centre.  Designyard, Cows Lane, Nassau Street, Dublin 2.  Forget Me Not ( The Craft Shop), Donegal Town.  Eblana Gallery, Baggot Street, Dublin.  The Tuckmill Gallery, Dublin Road, Naas, Co Kildare. Review written by Neil Collins (Editor) (November 2008).  For more ceramicists, see: Jane Jermyn (abstract), Sara Roberts (porcelain), David Seeger (abstract).  For more information about ceramics, see: Homepage.